Lending library in the registration office for DVDs, VHS, books and tapes. 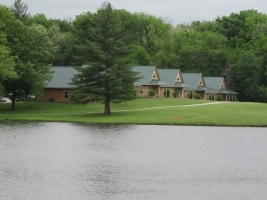 Located on 167 acres of the newly discovered “Peace of Heaven on Earth”, Cedar Creek Resort which is located in Mid-Missouri. 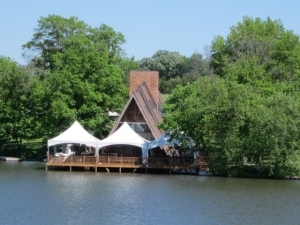 It offers all the amenities you desire in a vacation destination, nestled in a beautiful natural setting around a 25-acre lake. For more information or to reserve your cabin today: Request for Information Form or call 1-573-239-8340. Beneath the mature trees around Newman Lake, the cabins at Cedar Creek Resort capture the essence of the classic family retreat. The newly constructed, upscale cabins feature professional interior design creating a charming, welcoming atmosphere. The cabins have one bedroom on the main floor with a Queen size bed and a full bathroom. There is a table that seats four and either a sofa sleeper or two futons depending on the cabin. Upstairs there is another Queen bed in the loft area with a ¾ bathroom. All cabins include beautiful mini kitchens, the living room area is furnished in log cabin style motif with a few having sofa sleepers while others have log-style futons. There is a vhs/dvd player and lcd television. Outside you will find a deck with a swing and chair to watch the sunset over the lake. Out back you can enjoy the picnic tables and grills available for your use. 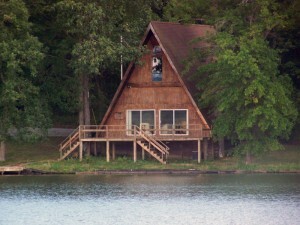 6 cabins are nestled between the main lodge and the A-Frame around the 25-acre lake. A-Frame sits at the south end of the lake with a private deck that makes for great fishing. It has a full kitchen and a woodstove in the corner of the large living/dining area. This 2,200 sq. ft. rustic home sleeps 10 with a ¾ bathroom on the first floor. There is a queen size bed in the master bedroom, 2 sofa sleepers in living room, 2 single bunk beds in each of the bedrooms on the 2nd floor as well as a loft with another twin bed and a sofa sleeper.